THE FIFTH CENTURY, during which St. Geneviève graced the city of Paris, was the century par excellence of the radical transformation of Western Europe, and of France in particular. Although Gaul (present-day France) still constituted a thriving part of the glorious Roman Empire, the continual incursions of barbarian tribes desolated it, and, towards the end of the fifth century, the tribes of the Franks, Visigoths, and Burgundians, among others, having installed themselves in various parts of the country, were at war with each other over the conquest of the entire country. This century, however, though so very turbulent, constitutes one of the most glorious in the history of the Church in France. Receiving the first seeds of Christianity in the second century, France had been completely Christianized by the end of the fourth century. The newly-enlightened people already honored many Holy Martyrs and wonderworking Bishops. The most renowned among them, St. Martin the Wonderworker, probably founded the first monastic brotherhoods towards the end of the fourth century. Monasticism developed rapidly in the next century throughout the country; and for many centuries after, the monasteries would constitute virtually the sole centers of civilization in France, which was suffering from the barbarity of its new inhabitants. 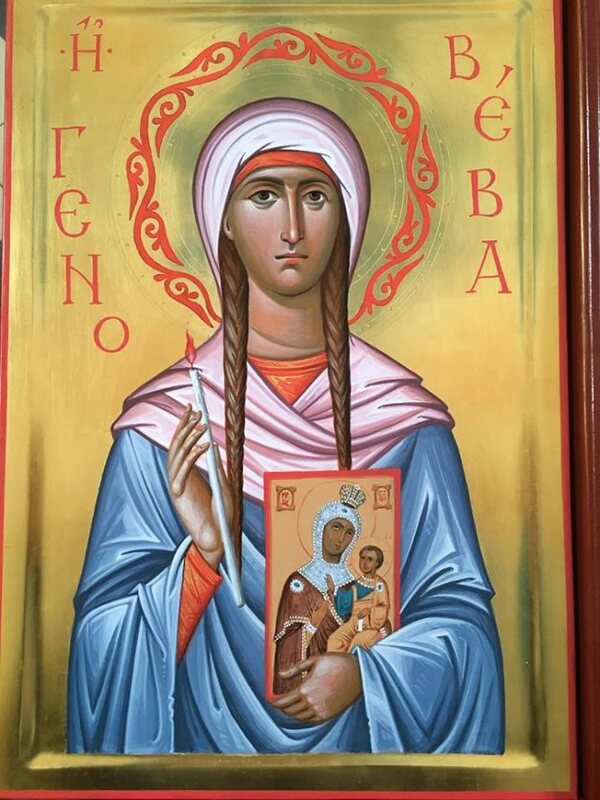 ONE OF the greatest saintly figures of the fifth century is St. Geneviève. She was born around 422 in the village of Nemetodorum [present-day Nanterre—Trans. ], several kilometers west of Paris, to wealthy and pious parents, Severus and Gerontia. In her childhood, she pastured her parents’ flock on the wooded hills on the banks of the Seine. When she was around eight years old, God summoned her to dedicate her life to Him in the following manner. Responding to Britain’s requests for aid in opposing the Pelagian heresy, a local Synod in France decided to send the most saintly and wonderworking Bishops Germanus and Lupus to that country. On their journey, the two Bishops passed through Nemetodorum. The pious people greeted them with holy enthusiasm and asked them to celebrate Vespers together. The holy Bishop kept his hand on Geneviève’s head throughout Vespers and told her parents to bring her to the Church very early the next day. Then St. Germanus found a coin on the ground that was marked with the sign of the Precious Cross, and he gave it to her to hang around her neck as a reminder of her vow, instructing her never to wear expensive garments and jewelry. On a certain Feast Day shortly thereafter, her mother was going to go to Church and told Geneviève to remain at home. Her pious daughter protested, reminding her of her promise. Her mother then slapped her and...was immediately blinded! Later, the Saint brought water to their house, prayed for the healing of her mother, and made the sign of the Cross over the water. When her mother, Gerontia, washed her face with the blessed water, she regained her sight! When she was around fifteen years old, Geneviève went to the Bishop with two other virgins to receive the monastic tonsure. Despite the fact that she was the youngest, the Bishop, inspired by God, tonsured her first. At that time, women’s monasteries had not yet been established. Thus, when her pious parents reposed a short while later, she moved to her godmother’s house in Paris, on the top of the hill across from the Seine, which now bears her name. There, she engaged in very strict asceticism, eating only on Thursdays and Sundays a little barley bread and beans, which she boiled every two or three weeks. The Lord permitted for a dreadful paralysis to come over her entire body, so that she could not move any of her members, and for three days remained as one dead. When she had recovered somewhat, she recounted that an Angel had taken her and shown her Hell and Paradise. The holy maiden dwelt particularly on the description of the indescribable good things awaiting the righteous. 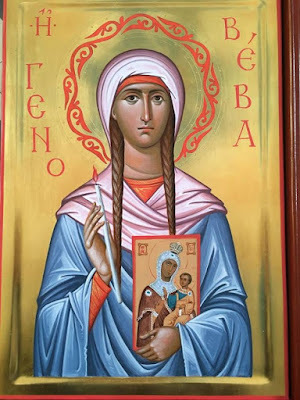 The blessed Geneviève soon reaped the succulent fruits of such an asceticism, acquiring in abundance the gifts of the Holy Spirit: the gifts of tears, clairvoyance, prophecy, and wonderworking. AS ALWAYS HAPPENS, when the Evil One saw that it was not possible to vanquish the Saint, he incited people to slander and condemn her. When, in 445, the most saintly Bishop Germanus was again going to Britain and passed through Paris, the Saint’s enemies criticized her to him. The God-bearing Hierarch took no account of the slander, but prayed with her and showed the Parisians the tears that the Saint had copiously shed as an indication of the gift she had received from the Lord. From then on the inhabitants of the region began to respect her and to seek her enlightened advice and her wonderworking prayers. One of the Saint’s prophecies, which was fulfilled, contributed much to establishing firmly in everyone’s conscience that she truly was a Saint. When Attila and his barbarian hordes drew near to Paris, the inhabitants were seized with panic and prepared to abandon the city. The Saint told them that the Lord would free them from danger, that they should not panic, but pray and fast. Not accepting her advice, the Parisians rose up against her and were ready to stone her. In the end, the Lord preserved her from the fury of the crowd, and the barbarian Huns suddenly and without apparent reason changed direction, and shortly afterwards were defeated by the relatively feeble Roman army under General Aetios, two hundred kilometers from Paris on the Champs Catalaniques (451). The anonymous biographer of the Saint relates multitudes of miracles in her Life, which was written just eighteen years after her holy repose: she expelled demons, healed paralytics, and gave light to the blind. Once, a sorrowful mother brought her the dead body of her four-year-old son. The Saint covered him with her cloak and prayed for many hours with tears, until the child was resurrected. Every year, following the Eastern ascetic tradition, she remained in reclusion from Theophany until Great Thursday. One nun attempted to observe what she did in reclusion in her cell, but when she reached the door, she was blinded. After the Great Fast was over, the Saint went to the cell of the blinded nun and, praying, made the sign of the Cross over her and restored her sight. St. Geneviève especially revered St. Dionysius (Dennis), the first Bishop of Paris, who had been martyred several kilometers to the north of the city. 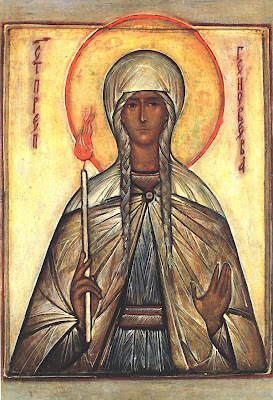 She therefore persuaded several Priests to build a church over the grave of the Holy Martyr. Objections were raised however, because there was no limestone for the construction. The Saint sent them to the city bridge. There, they encountered two shepherds who were discussing the fact that they had found a source of limestone in the forest! The church was soon built, and the blessed Geneviève regularly went there to pray, particularly on Sundays, when she would spend the entire night in vigil. One Saturday evening, she set off for the Church of St. Dionysius with her Sisterhood, even though a violent thunderstorm had erupted. Suddenly, their lantern went out from the strong wind. The nuns were overcome by great fear, finding themselves abandoned to the darkness and mud, without any orientation. The Saint heartened them, then prayed and made the sign of the Cross over the lantern. It miraculously lit up on its own and, guided by the miraculous light, they safely reached the church for the Vigil. 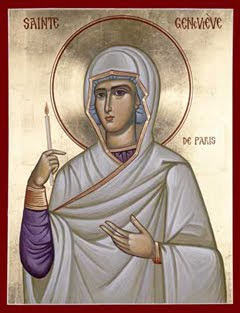 The Saint, together with the Sisterhood that had gathered around her, made many pilgrimages to the grave of St. Martin the Wonderworker in Tours, approximately two hundred kilometers from Paris, during which she worked many miracles. Yet another time, the Saint saved her city. When the Franks besieged Paris and the inhabitants were in danger of starvation, the Saint guided a fleet of ships to the regions that had not been destroyed by the Franks and brought them back loaded with wheat to feed the Parisians. We should mention the very important testimony of the great Saint of Antioch, the heroic St. Symeon the Stylite (†30 April 459), concerning the boldness of St. Geneviève before the Lord. Some Parisian merchants had gone to the East, and, attracted by the renown of the wondrous St. Symeon, who had been practicing asceticism for nearly forty years on a pillar in Antioch, they visited him in order to receive his blessing. But what was their surprise, when the most admirable ascetic told them to convey his greetings to St. Geneviève, and with great reverence asked for her prayers! The Saint was also renowned for her compassion, especially for the imprisoned, of whom there were many in that turbulent period. Many times she successfully interceded with the barbarian King of the Franks, Childeric, to liberate them. The King was unable to refuse her this, overcome by her fervent entreaty. the execution, and yet one more time the idolatrous King, who deeply respected her, spared the prisoners for her. The God-bearing and wonderworking St. Geneviève reposed in the Lord, in the fullness of years, on 3 January, probably in the year 512. 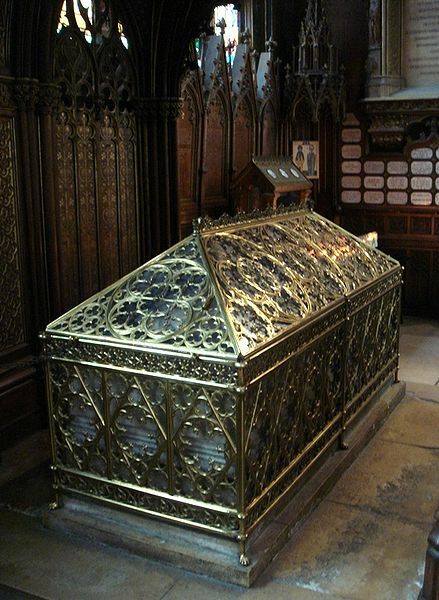 Her Grace-imbued Relics were initially placed in the Church of St. Dionysius, and later in the Church of St. Stephen in Paris, on the hill where she had offered her ascetic labors and her tears of love as a most precious dowry to Christ, her Heavenly Bridegroom. Through the holy intercessions of St. Geneviève, O Christ our God, have mercy on us and save us. Amen. 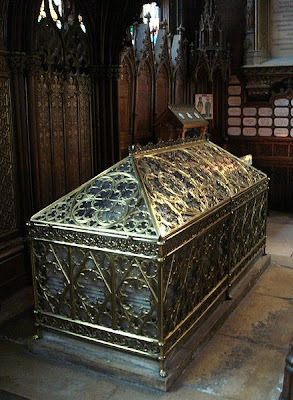 Note: Most of her relics were dumped into the Seine by the radical atheists of the French Revolution, but others were collected from churches around France to which they had already been distributed and placed in the reliquary pictured above. Through thee the divine likeness was securely preserved, O Mother Genevieve; for thou didst carry the cross and followed Christ. By example and precept thou didst teach us to ignore the body because it is perishable, and to attend to the concerns of the undying soul. Therefore, doth thy soul rejoice with the angels. Out of love for the Lord thou didst suppress the desire to rest, O venerable Geneviève, making thy spirit radiant through abstinence. Wherefore, thou didst tame wild beasts by thy power, and by thy supplications thou didst put down the uprisings of the enemy.